ECHONET is a communication protocol designed to create the “smart houses” of the future. Today, with Wi-Fi and other wireless networks readily available in ordinary homes, there is a growing demand for air-conditioning, lighting and other equipment inside the home to be controlled using smartphones or controllers, or for electricity usage to be monitored in order to avoid wasting energy. To achieve this kind of low-energy, comfortable, safe and reassuring lifestyle, we first need to create a system of rules or a “communication protocol” that can be read by any manufacturer’s equipment. This is where ECHONET comes in. The ECHONET Lite specification, in particular, is a communication protocol compatible with the now ubiquitous Internet. It is designed for ease of use and is simpler than the ECHONET specification. The ECHONET Lite specification is already compatible with more than 100 types of device, and is also being adopted by the smart electric energy meters that will be installed in all households in future. Japan and other nations share many common tasks, including the need to reduce CO2 emissions, reduce healthcare costs, and build safe, barrier-free societies. Various measures have already been implemented, both in industry and at the household level. Ultimately, however, a more effective resolution of these issues will require a systematic approach integrating many devices and systems. ECHONET is a next-generation home networking system designed to achieve these goals at an elderly date. Today, Japan not only faces difficulty in achieving its CO2 emissions reduction goal established in the Kyoto Protocol of 1997 (6% reduction between 2008 and 2012 compared to the 1990 level), it must significantly expand such reduction above and beyond 6% given further increases in CO2 emissions. 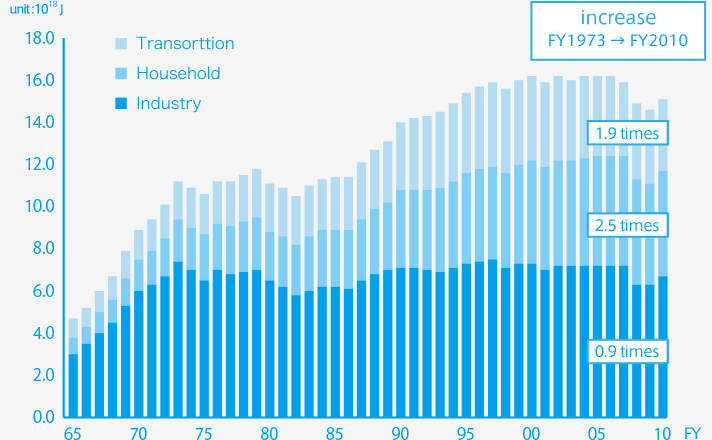 In particular, emissions from the consumer sector, which includes office buildings and private households, rose 2.5 times compared to 1973 in FY2010. This makes the implementation of countermeasures in the household sector a matter of utmost importance. Moreover, the government has set the goals of reducing emissions by 25% compared to the 1990 level by 2020, and of bringing on line photovoltaic facilities (which are highly effective in reducing CO2 emissions) capable of producing approximately 28 million kW (approximately 20 times the current level) by 2020. However, there are concerns that large-scale introduction of photovoltaic power generation will generate voltage build-up in transmission lines as power that is not consumed in households flows into the power distribution system, and that as a result the stable supply of high-quality power will be disrupted. Here, technical development is proceeding to address such concerns based on a new concept: the "smart grid." On the household side, however, there is a need to guarantee the stable supply of power by maintaining a power supply-and-demand balance between the distribution system and households. Required here is a "smart house" concept that will further energy-savings and ensure efficient use of generated photovoltaic energy by equipment installed in the home. 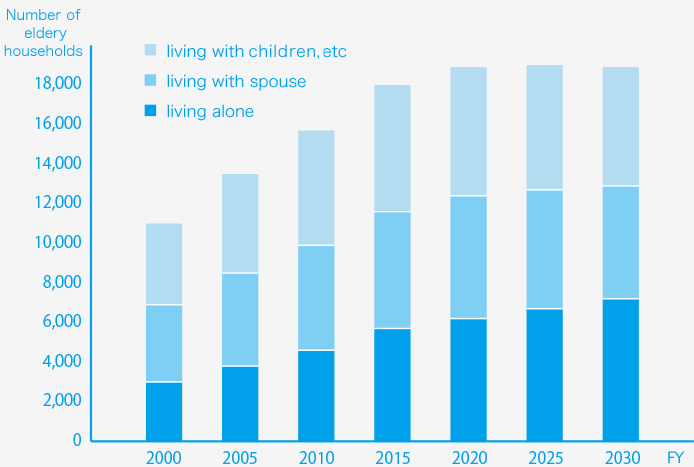 At the same time, as Japan's population continue to age, it is predicted that the percentage of households whose members are aged 65 years or old will reach 38% of all households by 2025. In fact, it is further predicted that the percentage of households whose members are at least 75 years old will reach 20%, meaning that one household in five will be an elderly household of people aged 75 or older. This will further increase the importance of daily living assistance that allows senior citizens to manage their health and live with peace of mind. The ECHONET CONSORTIUM is improving standards and actively participating in national projects toward resolving these various issues, while also promoting activities to support the global development of home networks.